Provides effective, smooth, non-aggressive exfoliation. Eliminates impurities and dead cells that suffocate the skin. 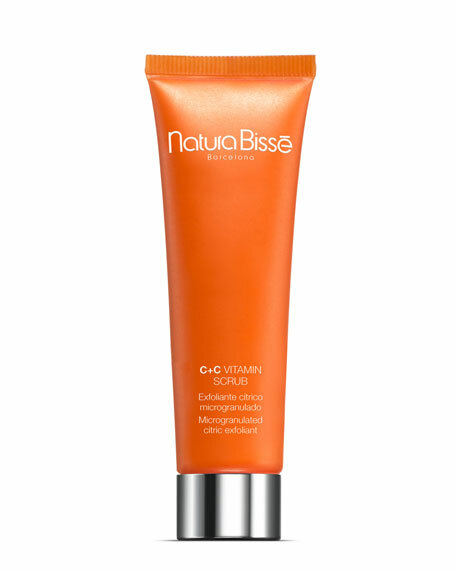 Protects the skin's lipid barrier. Enhances the penetration of treatment products applied subsequently. Helps skin recover a healthy glow. Silica powder: Micronized mineral particles extracted from gems, including quartz and amethyst. The fine particle size makes them especially suitable for the exfoliation of delicate areas of the face. The silica helps eliminate dead skin cells by polishing and refining the skin. Exfoliating sponges with bitter orange extract (Citrus Aurantium Amara) and bamboo: Soft natural micro-spheres that, when lightly massaged in, release their contents directly on the skin. The scrub combines the beneficial properties of botanical extracts of bitter orange, well-known for their revitalizing effects, with the natural peeling action of natural bamboo extract. The result: a highly effective exfoliating product with soothing and softening effects. Rosa Mosqueta seeds (Rosa Canina): Rich in Vitamin C and essential fatty acids. The selected particles are radiated with gamma rays to prevent microbial growth.